This club currently has been replacing my 5 iron for the last 5 years. Im 20 years old and only 5 foot 6, 130 lbs; and I can crush the ball farther than the average male golfer of middleage men. I hit my driver 280 yrds, and my fairways and woods around 240-260. I hit a 4iron around 220-240. I hit this CPR HYBRID easily 210+ yards replacing my 5 iron. The CPR series was very underrated when it came out, and still is an underdog today. This is my favorite goto club. 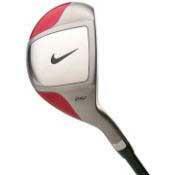 Best club I've ever owned. I can't stress enough how much I love this hybrids. I got my 22 degree used from a local golf shop and hitting shots up to 190-210 on a good day. It's hard to hit a bad shot unless you get tired an lazy. My 26 was bought on eBay for a good bid price and used it today. Again, it was the most amazing ball flight and distances up to 160 on a bad shot and 180 square on the face. Both hybrids are the best things I've ever owned and not leaving my bag anytime soon. Straight and workable shots from any lie. Simple.....Easiest club to hit that I have tried. Every level of golfer should benefit from this club. The shorter shaft and large head makes it very easy to contol. Nike needs to bring this back on the market. Taylor-Made, Callaway, Adams, Clevland, new Nike models. Bit of a weird club. When you're playing awful, hooking and slicing everything this is a great club, keeps everything online. But if you're playing half decent it's impossible to play with and every shot duck hooks. It's so different to all other clubs in the market, and the looks are no exception. I wouldn't recommend it if you're playing good. I recently purchased the CPR3 because I struggle with my 5&6 irons. I thought this would be a good replacement club. I now wish I would have made the choice much sooner! I can hit about 160 off any lie with this club, but I really like to work this in from 150 to 130 with a relaxed swing. It is hard to hit this club wrong. I have the steel uniflex shaft and get a high soft landing shot 9 times out of 10. These clubs are very consistant with a less than perfect swing. They make a great addition to anyone's bag. I have tried other hybrids, even the newer models, but none are as consistant as the CPR3.